Why did no one tell me Terry Pratchett was so awesome??? No, that’s not fair. A few people have said so, and a trusted advisor on all things geeky did recommend a few of Pratchett’s Discworld books to me, but only now am I finally getting around to reading one. And I am just about blown away! As I understand it, this isn’t necessarily the best of Pratchett’s Discworld work, and as far as cop fiction goes, it is fairly rote. But after getting through 20% of the book with no actual plot happening, yet loving it all anyway, I figure Pratchett is definitely doing something right. I was immediately charmed by Pratchett’s dry wit and found myself genuinely LOLing several times, particularly in relation to poop, a subject which I certainly had not expected to learn quite so much about. The story centres on Sam Vimes, commander of the Ankh-Morpork City Watch, who is off on vacation in the country side. As with any cop drama, it is impossible for a cop not to cop, even while on vacation, and especially when murder inconveniently happens during that time. In this case, the victim is a goblin. According to the mainly human perspective, goblins are barely worth anyone’s time, but Vimes is a man that respects life in its many forms, and especially in its living, breathing, thinking, feeling forms. As my first introduction to Vimes, I am equally charmed by the man as I am with his creator. I am also quite fond of the relationship between Vimes and his not so gentlemanly gentleman, Willikins. The pair reminded me of Cesare and Micheletto from The Borgias, only, older, with more humour, less giving of fucks, and fewer angst-ridden forbidden romances. Dropping into part 39/8 of a long-standing series isn’t generally wise, but the book does a fine job of not making me feel completely out of sorts. Certainly there are historical, political, and personal references, as well as some inside jokes, that I likely missed out on, but it was nothing that kept me from enjoying the book on its own. It just means that I have something to look forward to when I pick up more from the series. That Quote! He’s not pulling any punches is her:0)! I think this may be the post that pushes me into reading Discworld. For a non fangirl to be this blow away by book 39 is pretty impressive! I have heard many say that this is not the best, but that simply means that high standards isn’t a problem in future Discworld reads! He is awesome. And this IS a weak book by his standards; though I like it because b it let’s Sybil have some of the spot light. Have we seen the start of another person with a lifetime love? They seem to be a great couple. Glad I got to read something that shows her off a bit more than usual. Yay! Let me know which one you end up starting with! This was your first Pratchett?? You honestly have so much joy ahead of you – I’m a bit jealous! 5 out of 5 – it’s a woo hoo moment. 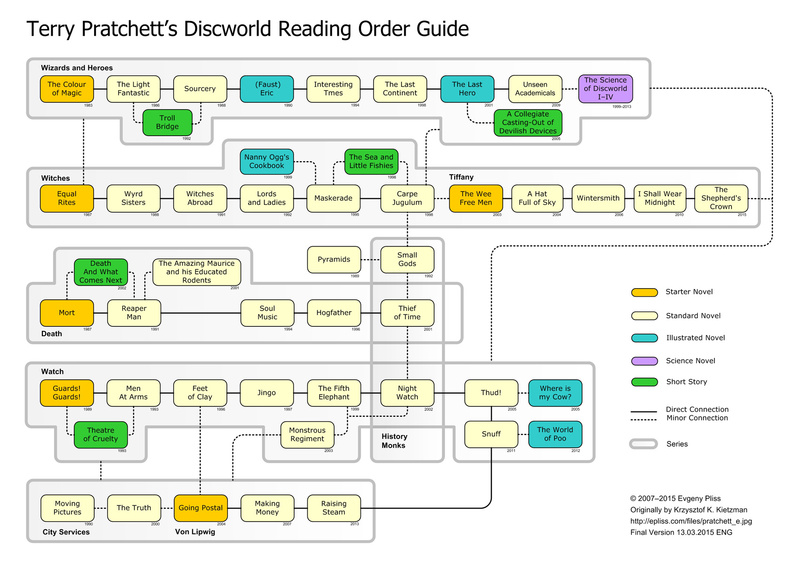 It’s not so much that the Pratchett books are a series, as much as a collection of series and standalones, all relating to the same world, with some sense of change and progression overall. Thank you! Those have been mentioned to me a few times so I definitely need to look into them. Welcome to the Discworld Lovers’ club. Snuff is one of the last books, and TP’s health seems to pop into that one, but yet I am amazed you gave it top score. I wonder how much would you give fan favourites “Small Gods” and “Night Watch”. Anyway, The Discworld novels are complete by themselves – TP would never expect you to have known the previous book in a series to enjoy the current one. Sure, some getting used to the characters helps, but when needed, he gives the context (and just as much as needed). please note, that the larger version has the last books as they are. The small version is older and had listed books that never came to be (like “Raising Taxes”, that is barely hinted at the end of “MakingMoney”, but was replaced by “Raising Steam”). It also features Shepherd’s Crown – the last ever book, and some short stories where they fit into the storyline.